We’d love your help. Let us know what’s wrong with this preview of Turtle Wish by Murielle Cyr. To ask other readers questions about Turtle Wish, please sign up. "Turtle Wish" by Murielle Cyr is a magic children's picture book about a little turtle and its early life.After hatching it makes its way into the water and tries to find its family and home. I love this beautiful story and I adored reading a children's book that deals with something so simple and precious as a turtle instead of relying on gadgets and superpowers to entertain. 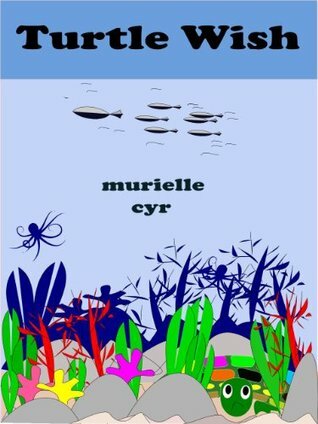 In times when all of us are so removed from nature and e "Turtle Wish" by Murielle Cyr is a magic children's picture book about a little turtle and its early life.After hatching it makes its way into the water and tries to find its family and home. A heartfelt story about the journey of a lonely little turtle looking for love, acceptance, and safety. What a heartwarming story about the life of a lost turtle desperately searching for a home. “Turtle Wish” is a sweet short story written by Murielle Cyr. The story leads young readers through the journey of a newborn turtle trying to survive on her own. The author teaches children about the life of wild animals from the moment they enter the world. Born in the wildness and left without the prote A heartfelt story about the journey of a lonely little turtle looking for love, acceptance, and safety. Born in the wildness and left without the protection of her parents, Hatchling faces danger waiting for her with each step on her way to the water. She has already lost most of her siblings, trying to find a safe place as soon as they were hatched. Lost and frightened, the tiny turtle is trying to avoid the dangers awaiting her around each corner. Being young and inexperienced, Hatchling could not separate enemies from friends. Watching little animals surrounded and protected by their parents, she wishes she could find her mom and finally feel safe and loved. But before that happens, the courageous little turtle must overcome many obstacles. In her desperate search for a safe place, Hatchling bravely explores the life around her, trying to fit into unknown surroundings. Moment by moment, she intuitively learns how to avoid dangerous situations and how to survive on her own. The author cleverly uses the little turtle to show young readers how important it is to have a family and the presence of parents in every child’s life. Ms. Cyr creatively parallels the journey of the naive little turtle to the danger that homeless children face daily. The book is sweetly written, and its colorful illustrations perfectly describe this story. I would highly recommend this book for young children and their parents, teachers, and babysitters. This story has many teachable lessons and emotional moments. Fantastic story the whole family can enjoy! Hatchling has just been born, and already she has seen dangers and horrors that no one should face. Predators chase her and gobble up her siblings. She can’t find protection and safety anywhere she goes. On a journey to find her family, she encounters rejection time and again. There doesn’t seem to be anywhere for her, no warmth or love. Yet she pushes on, heedless of the reactions she gets from others, until she finally finds what she is looking for. Once again, Murielle Cyr has delivered an impo Hatchling has just been born, and already she has seen dangers and horrors that no one should face. Predators chase her and gobble up her siblings. She can’t find protection and safety anywhere she goes. The pictures in this story book are simple, colorful, and easy for even the youngest child to understand. Not a very long book, I can see it becoming a favorite among the preschool crowd. This picture book follow a turtle hatchling that is already seeing the dangers of the world as a baby turtle. Shortly after being born hawks get her siblings and she left to fend for herself. Facing a lot of dang with every step closer to the water the little turtle struggles with safety and trying to find home. The turtle cannot differentiate between enemies and friends and trusts the wrong people. The story follows the little turtles quest to find a safe place to live and to find her family an This picture book follow a turtle hatchling that is already seeing the dangers of the world as a baby turtle. Shortly after being born hawks get her siblings and she left to fend for herself. Facing a lot of dang with every step closer to the water the little turtle struggles with safety and trying to find home. The turtle cannot differentiate between enemies and friends and trusts the wrong people. The story follows the little turtles quest to find a safe place to live and to find her family and her yearn to find a place where she belongs. She learns how to survive on her own. In the end family is important. Another one of those books with dozens of 5-star ratings....I don't understand it. Some things are beyond human understanding. Such a heartfelt story about the journey of a lonely little turtle looking for love, acceptance, and safety this show young readers how important it is to have a family and loving parents in every child’s life. So cleverly written and well written a talented author of note. Look forward to more of her books. Highly recommended and a great fantastic read. Fabulous! This is a fabulous story for youngsters. Thank you Murielle for an entertaining story. Murielle Cyr is author of Culloo, a novella for young adults.Her short stories and poetry have appeared in several literary magazines through the years. The Daughters’ Story is her debut historical fiction novel. She holds Creative Writing and Education degrees from Concordia University. She lives in Richelieu, Québec, just south of Montreal.